(1985) Pack Up the Plantation: Live! Singles from Pack Up the Plantation: Live! "Needles and Pins" b/w Spike (live) - Unreleased MCA-52772"
"Refugee (live)" b/w "Don't Do Me Like That" (live) - Unreleased, "Here Comes My Girl", "The Waiting" MCAT 1047"
"So You Want to Be a Rock 'n' Roll Star" b/w "American Girl" MCA 1028"
Pack Up the Plantation: Live! 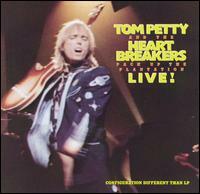 is the first official live album by Tom Petty and the Heartbreakers, released in November 1985. It was primarily recorded at the Wiltern Theatre during their 1985 tour but also includes several tracks from previous tours. It was released as a double LP or single cassette and compact disc. Stevie Nicks, who has collaborated with Petty and has appeared with him on tour frequently, sings with Petty on two songs on the record. The first is a cover of the Searchers' 1964 hit "Needles and Pins", which was released as a single and climbed into the Billboard top 40. Nicks' second track is "Insider", one of two cuts from Petty's 1981 LP Hard Promises that feature her. No other singles were released from the album in the US, although a cover of the Byrds' 1967 hit "So You Want to Be a Rock 'n' Roll Star" was released in Europe. "Refugee" was also issued in Europe on a four-track EP. Another fan favorite, "Breakdown", appears at the end of side one. It is notable because the audience takes over from Petty at the start, singing the first two verses and the chorus loud enough to be picked up by the mics. He quipped, "You're gonna put me out of a job", to huge applause, and then launched back into a reprise of the second verse. The recording garnered somewhat mixed reviews, with Sandy Robertson, writing for Sounds, describing it as "a turgid four-sided video soundtrack". [clarification needed] Jimmy Guterman, writing for Rolling Stone, said that Petty "sounds impassioned and impressive when he lays into his early songs" and that the Heartbreakers are "an undeniably great band". All tracks written by Tom Petty except as noted. The cover songs "So You Want to Be a Rock 'n' Roll Star" and "Don't Bring Me Down" would later appear on Playback; "So You Want to Be a Rock 'n' Roll Star" also shows up on Anthology: Through the Years. The two songs only on vinyl or cassette have never been officially released on CD. Both songs were also initially not included in the 2015 Hi-Rez remaster, despite being a digital download without time limits, but after fan response, they were belatedly added to the release. Ron Blair – bass on "Insider", "Needles and Pins", "Stories We Could Tell", "Don't Bring Me Down"
Phil Jones – percussion on "Insider", "Needles and Pins", "Rockin' Around (With You)", "Shout"
Bobby Valentino – violin on "Stories We Could Tell"
Stevie Nicks – vocals on "Insider", "Needles and Pins"
^ "Tom Petty: Pack Up The Plantation—Live!". Blender. Archived from the original on June 15, 2008. Retrieved November 5, 2017. ^ Kot, Greg (September 1, 1991). "Through The Years With Tom Petty". Chicago Tribune. Retrieved November 5, 2017. ^ Strong, Martin C. (2006). The Essential Rock Discography. Edinburgh, UK: Canongate. p. 816. ISBN 978-1-84195-827-9. ^ Guterman, Jimmy (1986-01-16). "Pack Up The Plantation: Live!". Rolling Stone. Retrieved 2013-01-01. ^ "Tom Petty: Album Guide". rollingstone.com. Archived from the original on July 14, 2011. Retrieved November 4, 2017. ^ "Tom Petty And The Heartbreakers Chart History". Billboard. Retrieved 2019-03-24.